Immaculate 1-year old Vale of Avoca champ level emerald green stain dress with white embroidery and golden underskirt. Made for a petite teen with red hair. 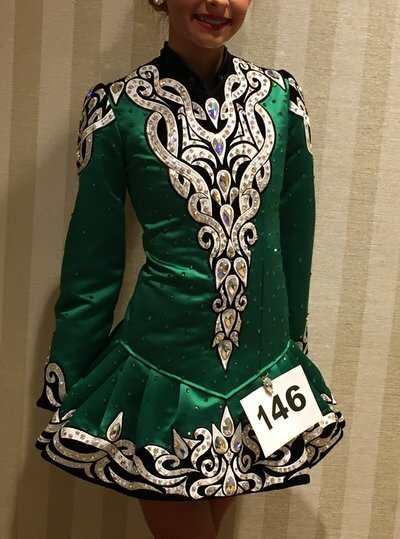 Dress is covered with green Swarovski crystals with AB tear drops and smaller Swarovski crystals accenting the embroidery (all are intact). This unaltered dress has about 3″ for let out and 2″ for let down. Comes with gold bloomers and embroidered tiara from a non-smoking house.